Letter From Santa with a Balloon! Back in October, I was sent a balloon, but not just any balloon I must add, but the biggest, coolest and best balloon I have ever seen, actually, we're not far away from December, and this balloon is still going strong, it's deflated, but it's not ready for bed just yet! To see more on that, check out my Halloween feature here, but for now, I must share something else with you, something even more exciting then the Halloween balloon, even though that was super cool in itself! Now it's officially less than one month away until Christmas, I think it's acceptable to talk all things Christmassy, even if you don't, I'm sorry but I'm going too anyway, live a little, stop being a scrooge and lets get into the Christmas spirit! The North Pole as we all know is a whole different world to the world we live in, it's magical, festive all year round, it's where toys are made and lets not forget one of the most important people in the world lives there - SANTA! 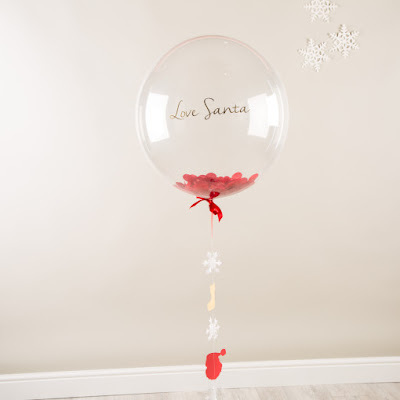 Santa is so bored of sending Christmas letters in the post, he's decided to come up with a new idea, and hire the services of Bubblegum Balloons to send your child a letter from him on the end of a balloon! 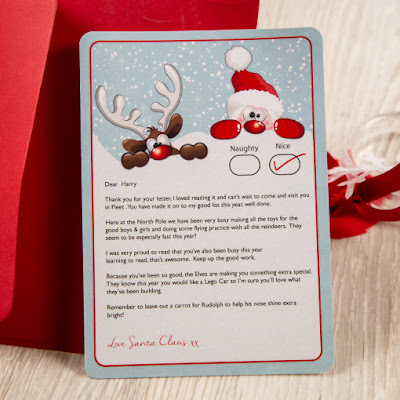 All Santa needs to know, and Bubblegum Balloons too of course, is your child's name, address, their achievement (like keeping their room tidy, being nice to their sibling, or completing all their homework) and what toy they'd like for Christmas! Just four tiny bits of information is needed to make such a wonderful product! If you're reading this thinking, it's only a balloon, then please read on. Filled with beautiful gold, red and green confetti, the balloon, which is made from plastic (making them very durable) can be expected to stay afloat for 1-2 weeks approximately, but they've held the record for lasting up to 4 weeks, which I can vouch for with our Halloween one still afloat in Spud's room! Each balloon is approximately 40cm in diameter and the tails are approximately 1.5 in length, which leads me onto the next part of this balloon! The tail, it isn't just any old ordinary balloon tail, it's the most festive, magical and Christmassy balloon tail your find, you all know I'm a lover of all things unique, and unique is what this product is! Made with red Father Christmas pieces, goldeny cream stockings and white 3D snowflakes, the tail connects to the balloon with a beautiful Bubblegum Balloons signature bow in red. Last but not least, the tail holds the very important letter from Santa at the bottom of it! 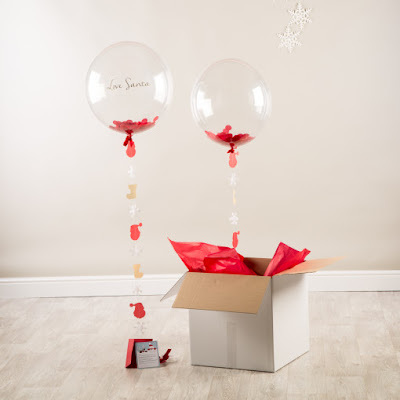 Arriving in a 42cms squared white box, the balloon will be carefully wrapped in sheets of coordinating tissue paper! Filled with helium on arrival, once opened, the recipient will be surprised as the balloon will float out of the box, a lovely surprise I must add! I'm 25 years old and it was a lovely surprise for me!! 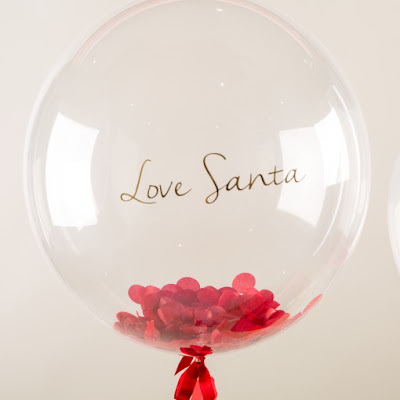 Priced at £35.40, it is a little bit more expensive then the letters that you pay for by post, but this magical balloon is worth every penny spent, because the memories will last a lifetime, as your children go on to tell their children that Santa once sent them their letter via balloon! It will also have your child so excited to tell their friend and family members too! To find out more about Bubblegum Balloon check out their website here, or find them on Twitter here. Games To Play Over The Festive Season! Getting Into The Festive Fun Spirit! WIN: A Money Box with #AnimalResolutions! Tips to Help You on Your Moving Day! WIN: £150 House of Fraser Gift Card! Pretend to Bee - Scott Tracy Costume Review. Christmas Gift Guide 2015: Food & For Foodies! Evans Lichfield Review and Competition! DIY Christmas Cards For All & Competition! The Magic of Christmas in Sicily! WIN: £50 London Designer Outlet Voucher! Four Self-Help Tips for Migraine Sufferers. Jolly Clothing Review and Competition! WIN: A Selection of Prizes from Ridley's! Max Tow - The Towing/Pushing Truck Review! Does Your Child Need Ear Tube Surgery?